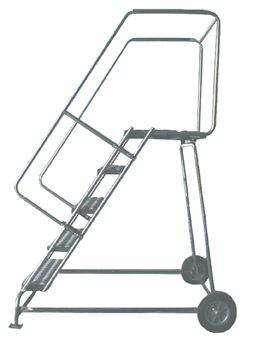 Lightweight, corrosive resistant ladder is ideal for outdoor requirements. Ideal for rough surfaces - comes standard with skid plates and 10" rubber wheels. 300 lbs. capacity. Lightweight lift and wheelbarrow portability. 7" D. intermediate treads, 10" D. top step. Available in (G)Heavy Duty Serrated Grating or Solid Ribbed Tread. All welded unit is shipped set-up. FOB Shipping Point. Options available ... contact dealer for availability and pricing (not all options available on all part numbers). Product No. No. Steps Top Height Tread Overall Height Step Width Base WXL Base W x L Wt.(lbs.) Price Ea.